Claire Bidwell Smith After This: When Life Is Over, Where Do We Go? After This: When Life Is Over, Where Do We Go? "With wisdom and grace, Claire Bidwell Smith navigates the mysteries of grief to show us that there is great meaning and even magic to be found in exploring the unknown." --Maria Shriver, bestselling author of What's Heaven? "With deep compassion, profound vulnerability, and transcendent lyricism, Claire Bidwell Smith embraces that which we so often run from in this culture: loss. This is a transformative book that will change the way you think about death, and by extension, life." "Claire Bidwell Smith's tender journey of love and loss will leave you feeling connected and hopeful." --David Kessler, co-author of On Grief and Grieving with Elisabeth Kübler Ross. 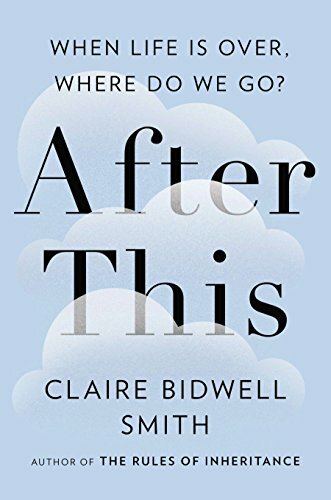 In After This, acclaimed author, and therapist Claire Bidwell Smith confronts the question she encounters every day in private practicewhat happens after we die? Chronicling our steps along the path that bridges this world and the next, Smith undergoes past-life regressions and sessions with mediums and psychics and immerses herself in the ceremonies of organized religion and the rigor of scientific experiments to try and find the answers. Drawing on both her personal losses, recounted in her memoir The Rules of Inheritance, as well as her background working in hospice as a bereavement counselor, Smith attempts to show how exploring the afterlife can have a positive impact on the grief process. 1. After This: When Life Is Over, Where Do We Go?